HEPA is an abbreviation of Hetahetam-Po Ambara signifying "Proclaim what is in your heart". The project recorded oral testimonies from local communities in Androy and Anosy. 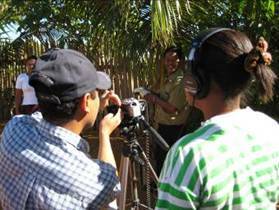 It produced 5 films, a book in three languages, and a range of web publications; the testimonies have been disseminated locally, nationally and internationally to increase the voice of local populations, and improve awareness about the knowledge and experience of indigenous people in southern Madagascar. Members of the community in Faux Cap southern Madagascar filmed these video on themes they chose to reflect their environmental and life challenges. The videos were aired and discussed locally and regionally with decision makers for wider debate on the issues arising; some were also shown internationally for the Day of Indigenous People and the Copenhagen Climate Summit. Panos London has produced a short (3:51 min) film about its Oral Testimony work called Stories to tell, stories to hear. Watch it here. Two of the films made by the local beneficiaries under Project HEPA have since been shown at the Copenhagen Climate Change film festival 2009 to help debate around climate change adaptation and highlight issues for developing countries.